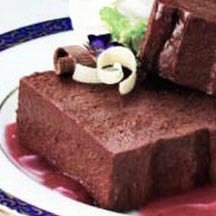 Delight your guests with this splendid dessert—a slice of smooth and creamy chocolate pate served atop a pool of cranberry coulis. For Cranberry Coulis: Purée all ingredients in a blender or food processor until smooth. Chill. Makes 1 3/4 cups. For Chocolate Pate: Line an 8 1/2 x 4 1/2 x 2 1/2-inch loaf pan with plastic wrap. Combine 1/4 cup cream with egg yolk; set aside. Combine chocolate, corn syrup and butter in a medium saucepan. Cook over low heat until melted, stirring frequently. Remove from heat. Add cream mixture to saucepan. Cook 1 minute over medium heat, stirring constantly. Let cool to room temperature. Beat remaining cream with vanilla in a small mixing bowl until soft peaks form. Use a rubber scraper to gently mix the chocolate into the whipped cream. Pour into pan. Cover with plastic wrap. Refrigerate overnight or freeze 3 hours. Spoon some Cranberry Coulis on a dessert plate. Place a slice of Chocolate Pate on plate. Garnish with whipped cream. Nutritional Information Per Serving (1/10 of recipe): Cal. 443, Total Fat 30grams, Saturated Fat 18grams, Protein 3grams, Carb. 48grams, Chol. 86mg, Dietary Fiber 3grams, Sugar 35grams, Vit. A 215RE, Folate 4Ug, Vit. E <1mg, Vit. C 7mg, Sodium 83mg, Pot. 34mg, Iron 1.5mg, Calcium 44mg, Zinc <1mg.